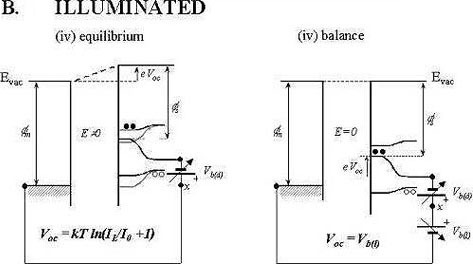 Figure above shows how equilibrium is attained between two surfaces when they are placed in external electrical contact. The surface fermi-level of the semiconductor shifts during illumination. In this case the semiconductor is a pn junction and we obtain the open circuit voltage. However as the Kelvin Probe measures this via the front surface we also measure (in series) the surface trapping too. The figure below explains this. This figure shows the effect the semiconductor-oxide interface plays in understanding surface potential changes measured with the Kelvin Probe. The oxide and/or semiconductor-oxide interface charges up during illumination. This alters the threshold voltage as measured by the probe. These changes can be quite large: up to 0.5 V. The semiconductor interface can be very sensitive to even low levels of illumination of even a few lux.